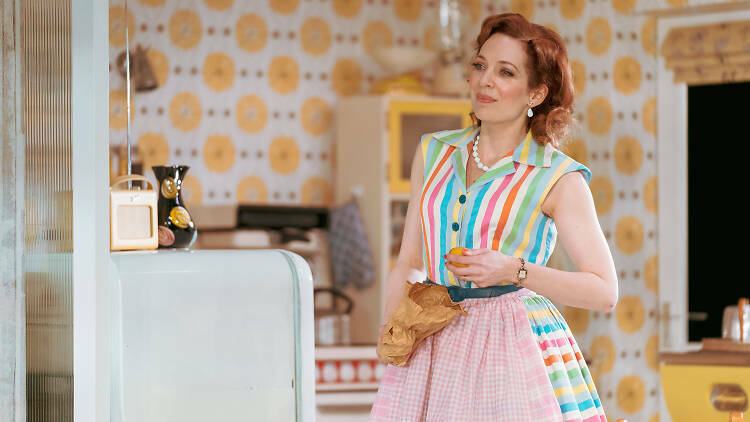 We went earlier this week to see Home I’m Darling, Laura Wade’s sparky play about a woman who ‘chooses’ to stay home and recreate the role of a 1950s housewife – spot-free kitchen, husband-slippering and all. It’s a really original idea: the recreation is Judy’s own, and it mixes commitment to authenticity (clunky frig, relentlessly bright decor) with streaks of contemporary living. So once husband Johnny is seen out of the door and off to his pedestrian estate agent job, sandwiches in briefcase, Judy opens the kitchen drawer and pulls out – a laptop. We are regularly tipped into uncertainty whether hers is a genuine if eccentric lifestyle choice or a delusional form of escapism. It’s all about ‘choice’ (those quote marks again), and what we mean by it . Judy is offered voluntary redundancy from her job in finance. She takes it, without much consultation with her husband, and this in spite of the fact that hers is the higher salary. She also – and this is a key indicator of the play’s contemporary relevance – is better qualified than Johnny, with a university degree. Who are we to say that this was not a genuine choice, a personal defiance of social norms? Of course that’s precisely the point: when someone makes a decision that looks to us as if it’s a surrender of their autonomy and independence, what do we call it? The play takes us into Stepford Wives territory: Judy’s smile is rigorously fixed and we cannot believe she is really enjoying her life, but what right do we have to tell her that she’s fooling herself? Of course in the end – or well before it – the wheels come off Judy’s 1950s world. In a neat irony, she loses control of the household finances when Johnny continually fails to get a promotion, and their home ownership is threatened. As a result (semi-spoiler alert) she goes back to work – and again we can ask how far that is a choice, or something forced on her by circumstances. By coincidence, immediately before the play I had a cup of tea with a friend who was one of my Paula Principle interviewees and she (Brenda, in the book) had volunteered how much Paula factor 5 – choice – had resonated with her. We then talked about her daughter: Deirdre is very well qualified in the medical world but is not pursuing a conventional path upwards to consultant status, choosing instead to complete a research doctorate. This kind of choice is a far cry from Judy’s abandonment of her job; Deirdre is very much committed to a professional career, it’s just not a conventional pattern. But what is the subject of her thesis? As it happens, it is (roughly) about information and how this can be improved to enable better choices in healthcare. Brenda and I discussed just how much choice we as individuals actually want to make in that sphere, and agreed that there are limits on how much we want to be asked to choose when it comes to health/medical decisions. In short, all those philosophers, psychologists and now neuroscientists have not succeeded in giving us foolproof ways of deciding what are genuine choices and what are not. I like Jonathan Haidt’s image of us as small mahouts each riding a large elephant of unrecognised tendencies and drives. But that doesn’t mean we can deny choice because it runs against our own inclinations, or has predictably poor outruns, as Judy’s does. Home I’m Darling would make a great text for any number of student courses, from gender politics through history to cognitive neuroscience.